Map Status : None - You need to be logged if you want to do the surface mapping. Then use an AutoHotKey script (F9_Surface_Mapping_QWERTY.ahk or F9_surface_mapping_AZERTY.ahk regarding your locale and keymap) in the game, in the planetary surface display. Zoom in, not too much. Check your keymap in the game and be sure to use WSAD (or ZQSD) in the Galaxy Cam Tanslate, if not, you'll have to modify the ahk files. Finally, press F9. Warning : Please do not go on the surface of the planet while you're mapping the surface, otherwise you (we) will have blue arrows in the map ! Put PNG screenshots in this order (drag'n drop authorized) and click submit. If ok, you can Generate the map. And if everything's alright, click finally on Publish. 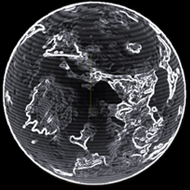 You'll then be able and all players using ExTool to see the surface on the planet in ExTool, instead of white sphere with latitude and longitude lines. If you don't use an Extool screenshot plugin, don't forget to convert your bmp screenshots files to png ones before dropping files on Extool.